Hawn Jr. design, Displacement – 17,300 lbs, Ballast – 7,300 lbs (internal), Sail Area – 565 sq. 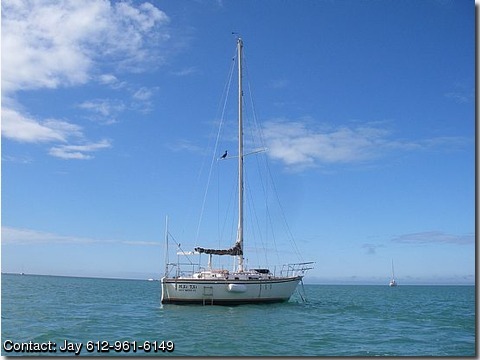 ft, Water – 2 aluminum tanks 35 Gal (under v-berth), Fuel – 35 Gal aluminum (port of engine), Hatches – 3 Bomar Hatches, Ports – 8 opening ports, Sails – 1-main (never used), 1-working jib, 1-110 jib, 1-staysail, 1-storm staysail. mainsail cover is in poor condition. dodger is in poor condition. Icom 402 vhf, Garmin 276C chartplotter w/swfl blue chip, 2 lifeline AGM 8D house batteries, 1 Optima AGM starting battery. NEEDS- Quarterberth and V-berth cover, Headliner, Bowsprit and Rudder Stocks (have old wood for forms) Trim installed (in storage box), Windlass, Seals on opening ports replaced, Masthead Light, Alternator, Interior approx 85% finished, Sole is plywood.